In the children’s book, The Little Engine That Could, is a valuable lesson that we adults pass on to our children but don’t necessarily follow. The lesson of the little engine that convinced itself it could climb that hill is not so much about accomplishing what is seen to be at first a formidable challenge, but in changing the way one looks at the challenge being faced. Ironically, we are all full of self-limiting beliefs due to thinking that the world we see is the real world. Our mental models—what we think—colors how we respond to the world around us. 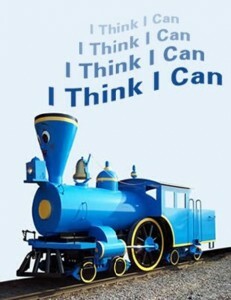 If we are like the little engine and keep telling ourselves I think I can, I think I can, chances are we are going to reach some level of success if only because we stuck it out. We’ve all been told that attitude is a major driver of success. Stories ranging from the athlete who overcomes a major injury to grasp an important win, to the impoverished person who rises to be a successful businessperson or artist or professional, often inspire us to rise above our own challenges. We watch sports because we love it when the under dog team finds itself with its back against the wall and fights its way to a win. If you watch basketball or football you’ll often see the opposite team call a timeout in order to halt the steam roller effect that is putting their victory in peril. In a previous post, What is Courage?, we shared the story of Bobby McMullen who lost his eyesight to diabetes and yet is a lifelong athlete and a competitive mountain biker. He’s also overcome cancer, clogged arteries and two separate kidney and pancreas transplants. His mindset is that physical limitations are simply challenges that can be overcome. He’s definitely got the I think I can, I think I can attitude about the world. He’s set his mind on seeing beyond what would for most of us be limiting infirmities. He sees himself finishing the races he competes in. Since what we see is what we think, how can you change your thinking so you can see the world in a different light? How is Your Time Management?